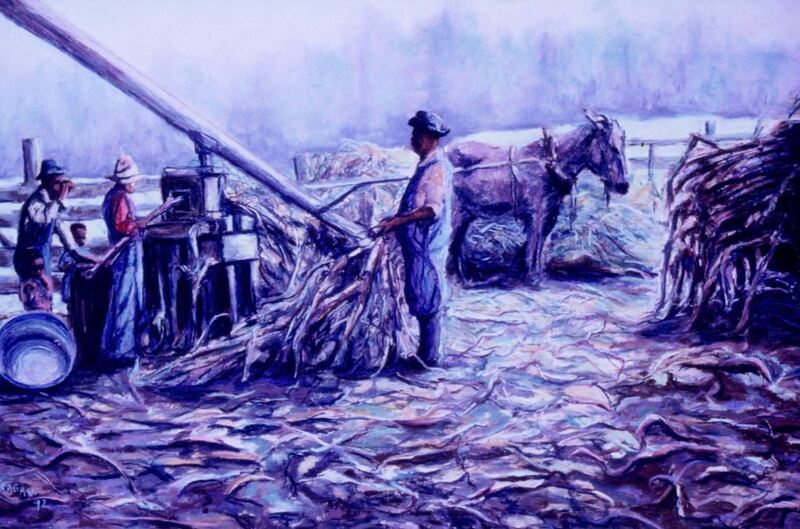 A painting by Bettye Reagan, a local artist in Central Florida, depicting farmworkers grinding sugarcane at the Wheeler family farm. The Wheelers lived at 340 South Lake Jessup Avenue in Oviedo, Florida. The family patriarch, Benjamin Franklin Wheeler, Sr. (1878-1954), was born in Dade City on January 2, 1878. After his father passed away in 1889, his family relocated to his mother's hometown in Oviedo. At age 16, Wheeler began working as a telegraph operator for the Atlantic Coast Line (ACL) Railroad. In 1898, he purchased a seedling citrus grove that had been abandoned during the Freeze of 1894-1985. Wheeler soon became a successful citrus grower and celery cultivator. Wheeler married George Lee Wheeler in 1908 and the couple later had three children: Clara Lee Wheeler Evans (1917-2010); Benjamin Franklin Wheeler, Jr. (1920-2006); and Miriam Louise Wheeler (b. 1922). In 1908, Wheeler partnered with C .F. Brannon and Steen Nelson to operate the Nelson Brothers packinghouse. In 1923, Wheeler purchased the company and renamed it Nelson & Company, Inc. Wheeler also served on the Seminole County Commission and the Oviedo City Council. He was also seminal in organizing the Seminole County Chamber of Commerce, the Florida Citrus Mutual, and the Citizens Bank of Oviedo. Original painting: Reagan, Bettye. Grinding Sugar Cane. 1994: Private Collection of Bettye Reagan. Digital reproduction of original painting: Reagan, Bettye. Grinding Sugar Cane. 1994. Reagan, Bettye Jean Aulin. 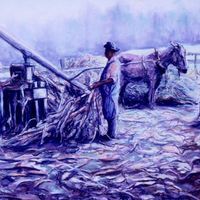 “Grinding Sugar Cane by Bettye Reagan.” RICHES of Central Florida accessed April 19, 2019, https://richesmi.cah.ucf.edu/omeka/items/show/6968.